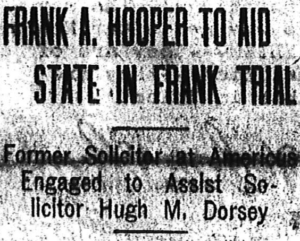 That the trial of Leo M. Frank will be a legal battle as brilliant as any ever fought in Atlanta is assured by Solicitor Dorsey’s announcement that Frank A. Hooper, Atlanta lawyer and former solicitor general of the southwestern superior court circuit, has been retained to assist the prosecution. With the case of the state in the hands of Solicitor Dorsey and Mr. Hooper and the defense resting with Luther Z. Rosser and Herbert Haas the contest is certain to be replete with the unexpected. Frank A. Hooper, who is Solicitor Dorsey’s choice to help the fight of the state, is distinguished as a state’s solicitor of twelve years experience. No lawyer at the Atlanta bar has seen a similar service as a prosecuting attorney. For this period he acted as solicitor to the southwestern superior court circuit at Americus. Following his term as prosecutor he practiced law in Americus being recently identified with such criminal trials as the Childers trial in Americus and the Cain trial in Cordele. In each of these cases in which the accused was acquitted Hooper appeared for the defense. He came to Atlanta four years ago as an associate of the late Governor J. M. Terrell. Pitted against Solicitor Dorsey and Mr. Hooper will be Luther Z. Rosser sometimes known among his confreres as “the best all-around lawyer in Atlanta;” Herbert Haas, a young but experienced attorney, and possibly others. The report has been persistent in Atlanta for a week that another prominent Atlanta attorney known as a brilliant criminal lawyer is to be associated with the defense. While this report has not been verified there are those who are confident that the defense will be augmented by his weight before Frank faces a jury in the stuffy little Thrower building court room. In making his announcement that Mr. Hooper was to assist in the Frank prosecution Solicitor Dorsey said that while Mr. Hooper had been his choice, Mr. and Mrs. J. W. Coleman, parents of the slain girl, had been consulted, and they directed him to employ such counsel as he deemed fit. The solicitor asserted that the Colemans had approved the employment of Mr. Hooper.